Islam Definition. Define Islam. One: Go to the Quran. re whom to stone, kill, not to befriend. To define Islam and Islamism, you must know traditional orthodox Islam. I had a tiny eureka moment today. On Islam and Islamism. My (newfound) viewpoint - those 2 terms should be applied in the opposite way. Usually the people who distinguish between Islam and Islamism define Islam as nice and good, and Islamism as something like "Islam gone wrong" "Islam misunderstood" "bad extremist Islam" "not the real Islam which is nice and good". My eureka moment: in reality, it's the reverse. Islamism - Islam that is non-orthodox, non-traditional. This term should refer anything but traditional Islam. In other words, using this definition, Muslims who are pro-democracy, against wife-beating, against killing apostates, are Islamists. That is to say, they consider themselves Muslim, but have thrown out some of the Quran, or even large parts of the Quran - as irrelevant, dated, etc. It can also mean, being even more harsh than the Quran - for instance, beheading someone who has converted to Islam. That is supposed to save your life (I think). 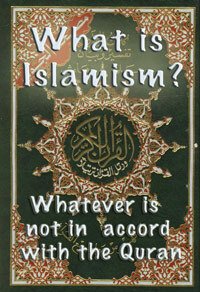 Defining Islamism as whatever is not in accord with the Quran is what makes sense. Instead, with the general use of the words Islam and Islamism, reality is garbled. 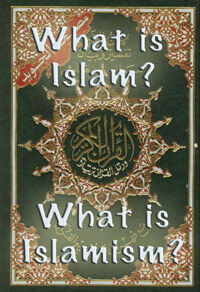 Islamism is used to refer to Islam, and Islam is used to refer to what is not Islam. Who gains? Not everyday people who are interested in reality, in what Islam is really about. 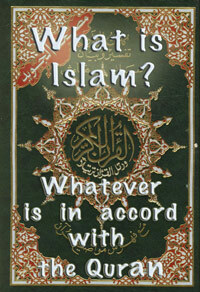 So, once again: Islam means in accordance with the Quran. Stoning for adultery, cutting off the hands of thieves, etc. Islamism means, as it always should have been used, not in accordance with the Quran: pro-democracy, pro male-female equality, no penalty for leaving Islam, equal rights to different religions (as long as they don't advocate violence).